With the majority of toy companies focusing on the 3.75" action figure market, there's been a disappointing lack of 6" figures on the shelves these days. Even back when Toy Biz was running the show, though, it was rare to see budget 6" lines vying for consumer dollars: these lines have mostly remained confined to the 3.75" scale, and even then generally consist of military figures. 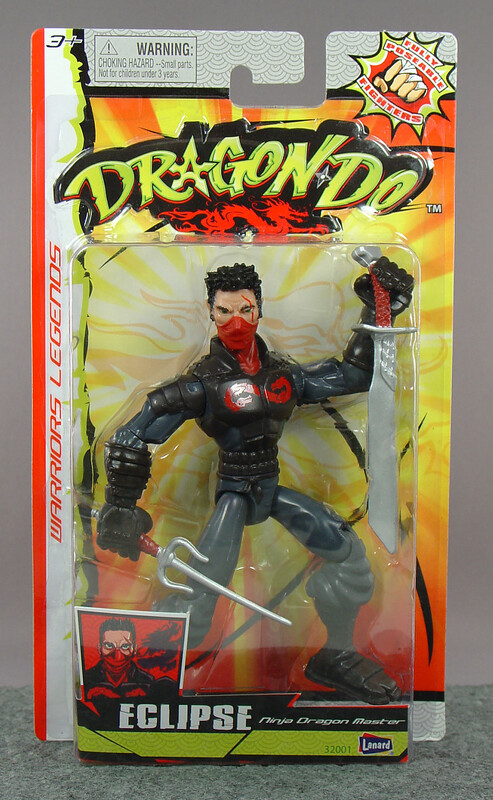 As such, you can imagine my surprise when I stumbled upon the new Dragon-Do action figures! Manufactured by Lanard Toys -- makers of the enduring The Corps! 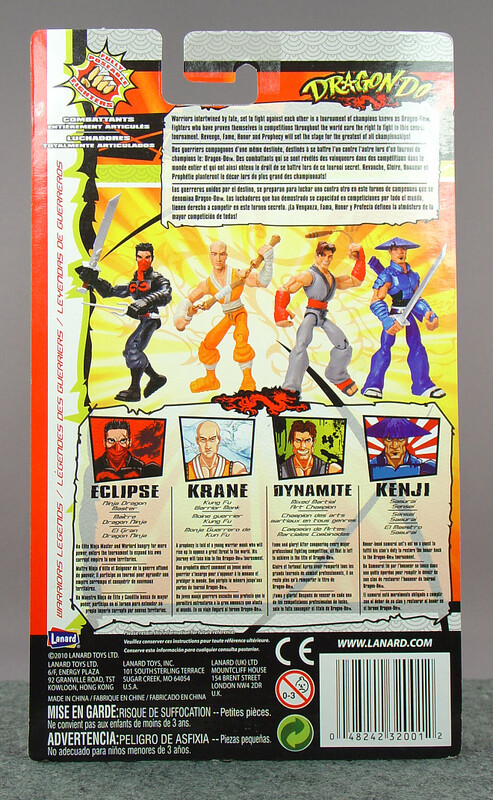 line -- these martial arts masters stand a full six inches tall yet only cost half as much as your average G.I. Joe. Warriors intertwined by fate, set to fight against each other in a tournament of champions known as Dragon-Do™. Fighters who have proven themselves in competitions throughout the world earn the right to fight in this secret tournament. Revenge, Fame, Honor and Prophecy will set the stage for the greatest of all championships! So that's the introductory story for the line. It smacks of generic fighting game material, but then so do the figures -- they kinda remind me of characters from Body Blows. Anyway, even though the price was definitely right, there's something about a 6" figure with a regular price of $2.95 that gave me pause... so in case the figures ended up being completely terrible, I decided to pick only one to start. Naturally, I went with the ninja. The packaging is nothing spectacular -- Eclipse comes on a standard blister card with only a paper insert (and of course the figure itself) to differentiate him from the others in the line -- but it is fairly attractive. I won't describe the card in full, as you can see it well enough and I want to keep this relatively brief, but noteworthy details include the ninja stars in place of the letter "A" and the hyphen on the "Dragon-Do" logo and a Chinese dragon in the center of the sunburst from which Eclipse appears to be emerging. Eclipse himself is sporting an action pose that unfortunately warps the crap out of the weapons, but would make Eclipse a welcome addition to the collection of anyone who would bother keeping a $3 figure carded. An Elite Ninja Master and Warlord hungry for more power, enters the tournament to expand his own corrupt empire to new territories. 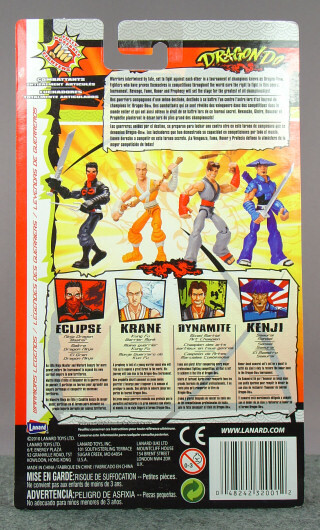 The back is similarly attractive, with the same general graphics scheme as well as the Dragon-Do tournament backstory (included in the article intro), small drawings and actual photographs of the other figures in the line, and brief blurbs noting their reasons for entering the tournament (Eclipse's is above). 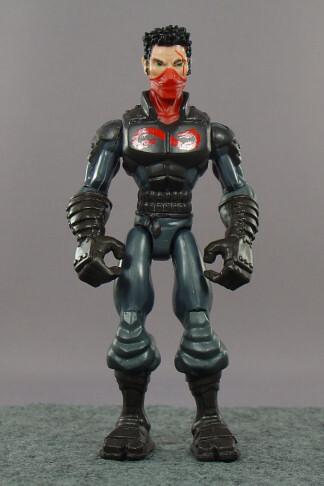 Honestly, it looks pretty darned good -- especially considering the low cost of this figure -- but there's one major problem that pulls the score down. See, the card is only 9.5" x 5.5", and there's a lot of text on here... especially as the backstory and character info are transcribed in English, French, and Spanish. As a result, the text is so small that it's barely legible. Eclipse has more of an animated style to him than a realistic one, but he's still rocking a fairly detailed sculpt. Sure, there are a few hiccups here and there (the gloved hands still feature fingernails, as Eclipse shares his upper body sculpt with the gloveless Kenji), but Eclipse more than makes up for them with such details as the numerous rivets and segmented pieces on his biker-esque jacket and gloves; spiky hair and bushy eyebrows befitting a badass evil ninja; and that wicked scar down the left side of his face. The paint is very well done, too -- note those menacing green eyes and that keen dragon emblem -- though admittedly it's difficult to gauge the crispness of the lines given that the dark purple and blue grey of the figure's outfit effectively mask errors where those elements meet. There's also some fantastic paint/plastic color matching happening here, as it's extremely difficult to tell which parts of the body are cast in which colors (the torso, upper arms, crotch, and upper legs are blue grey, whereas the lower arms and lower legs are the purple). I do have a couple of nitpicks. For one, the figure is assembled like an old school G.I. Joe -- with the upper arms and upper leg pieces consisting of two plastic halves glued together -- and on some figures and in some places there are very noticeable gaps between the pieces. Also, on my figure, the right knee was so tight that the paint sheared off of it when I tried to move it (which is how I was able to discern which parts were painted which colors). Finally, there's the animated look of the figure. While I can understand why Lanard might have wanted to go this route -- this more "kiddy" look might make the figures more appealing not only to kids, but also to parents who might otherwise balk at buying violent martial arts toys for their youngsters) -- I can't say that I wouldn't have preferred more realistic proportions for the head, hands, and feet. Granted, Eclipse stills look good... but if he and his fellow warriors looked more natural among 6-inch collector figures, they'd have made fantastic custom fodder or army building material. Eclipse won't win any awards for articulation, but what he's got is great for kids and juuuust enough to avoid alienating adult collectors. While the joint layout should be self-explanatory from the above image, it bears mentioning that the ball-jointed neck is restricted to a swivel and that the ball-jointed hips are of the T-bar G.I. Joe variety (except that here the bar is plastic rather than metal). In fact, Eclipse in hand feels a lot like an oversized G.I. 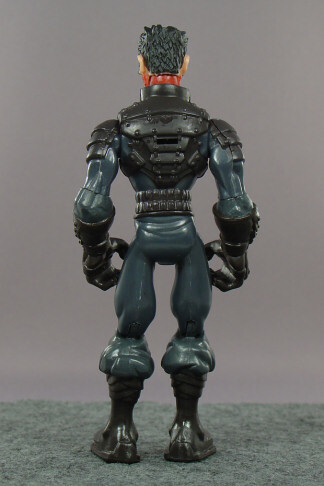 Joe figure -- only simplified, since, among other points, he lacks proper elbow hinges, wrist swivels, and ankle hinges. Kids probably won't miss these points too much, as there probably aren't too many of them who take advantage of superarticulation (remember, kids can still squeeze immense amounts of fun out of limited-articulation Ben 10 figures) and Eclipse is still more than capable of punching and kicking and lying on his back. Moreover, even with these shortcomings, the angled elbow cuts and oversized feet mean that Eclipse is capable of a number of poses and can effectively maintain his footing in them. Eclipse comes with two accessories: a sai and a long, straight sword (I want to call it a chokutō, but heck if I'm familiar with the various types of swords). Two weapons may not seem like much considering the wealth of stuff that you get with G.I. 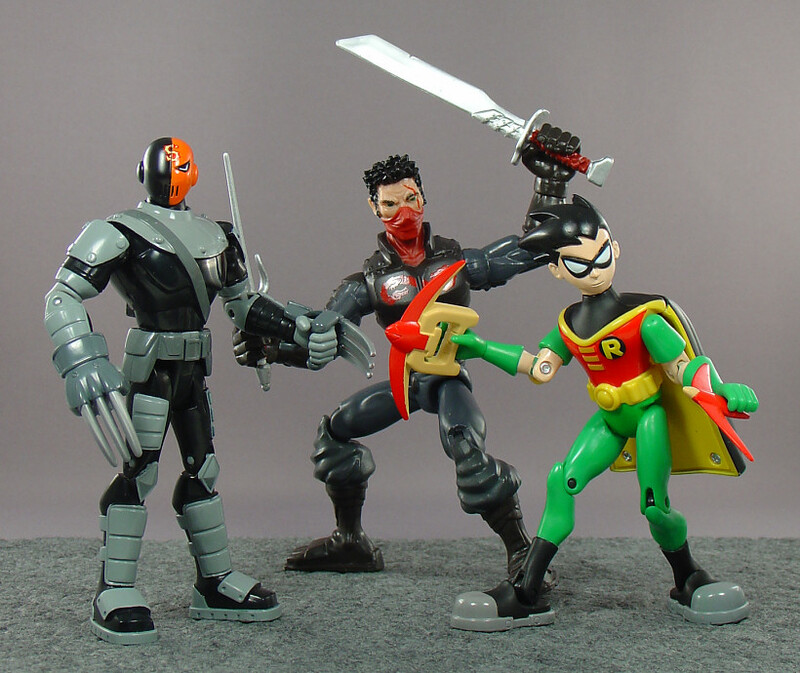 Joes and some other figures, but that's exactly how many weapons Eclipse can hold at one given time. As such, it's less likely that kids (or collectors) will lose them, and Eclipse can even stow the sword behind him via a narrower portion of the hilt that plugs into an indentation on his back. In addition, the weapons sport attractive sculpts -- with wrapping around the sai handle and intricate detailing on the sword handle and at the base of the blade -- and are even painted, which is more than one can say for the accessories of many action figures aimed at the younger crowd! 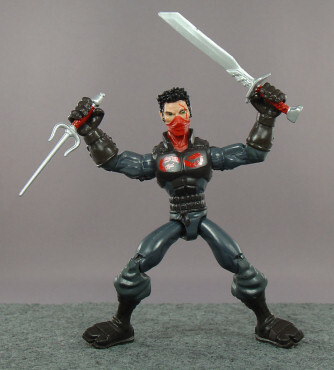 Really, my only problems here are that Eclipse holds the sword rather loosely (though securely, as in it's likely to wiggle around in his grip but not to slip from it) and that the weapons come out of the package pretty warped. A little hot/cold treatment can fix that, but kids who aren't able to implement that fix might be disappointed to have a ninja with bent weapons. Despite his shortcomings, there's no denying that Eclipse is a fun toy. 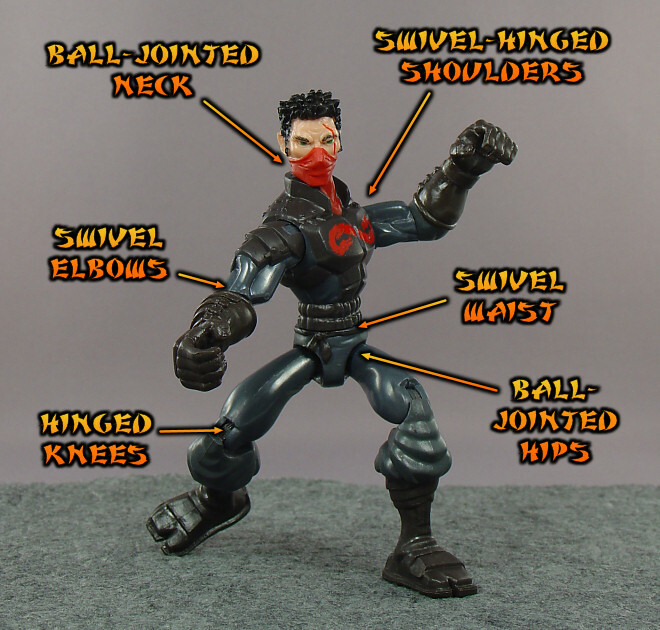 As I said, kids will have a blast with him -- in addition to being an evil ninja warrior with a cool outfit and a wicked scar, he's probably got just the right amount of articulation for a kid to take full advantage of without certain joints being superfluous. 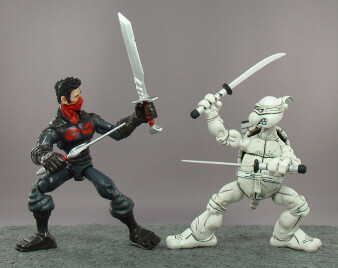 That fact and his more animated appearance might make him somewhat less fun or appealing for an adult collector... but hey, he's still an evil ninja with a cool outfit and a wicked scar, and the animated style does mean that Eclipse fits in more/less well with cartoon-inspired toylines like Teen Titans or Teenage Mutant Ninja Turtles. Also, while Eclipse feels fairly sturdy and should hold up well to the intensity of a child's play session, the Dragon-Do figures disassemble encouragingly easily in the hands of a customizer. One just needs to yank off the head (there's a double barbell configuration, so pulling it off will bring the barbell along for the ride), drill a hole down into the neck cavity, and use a pin punch or a screwdriver to pry the torso halves apart -- far simpler than the difficulty I've had cracking the torsos of other action figures, and having the hole in the neck cavity means that there are no obvious holes to sculpt over afterwards (as opposed to the holes that require filling when one has to drill in more visible areas). Of course, a customizer might prefer to use more articulated figures with more realistic proportions, but these guys are cheap enough that they might prove entertaining for side projects or splicing experiments with difficult-to-use fodder pieces. While Eclipse does fairly well in the other categories, this is the one in which the figure absolutely excels. 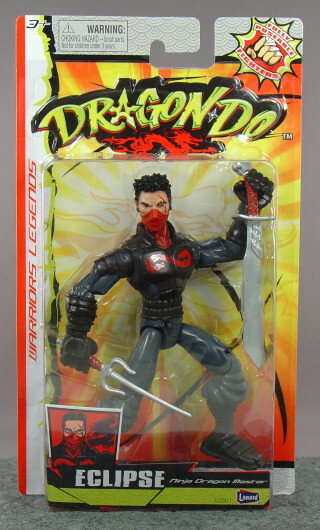 This toy -- a sturdy 6" action figure with a wicked cool scarred ninja sculpt and multiple accessories -- only costs $2.95. That's an impressively cheap debut price for a current 6" figure (as opposed to an unwanted one that's been sitting on the shelves for months before finally hitting deep clearance), especially when one considers that this figure is more poseable and fun than many licensed figures that cater to children -- I'm specifically thinking of some of the more recent stuff from Bandai and McFarlane Toys. 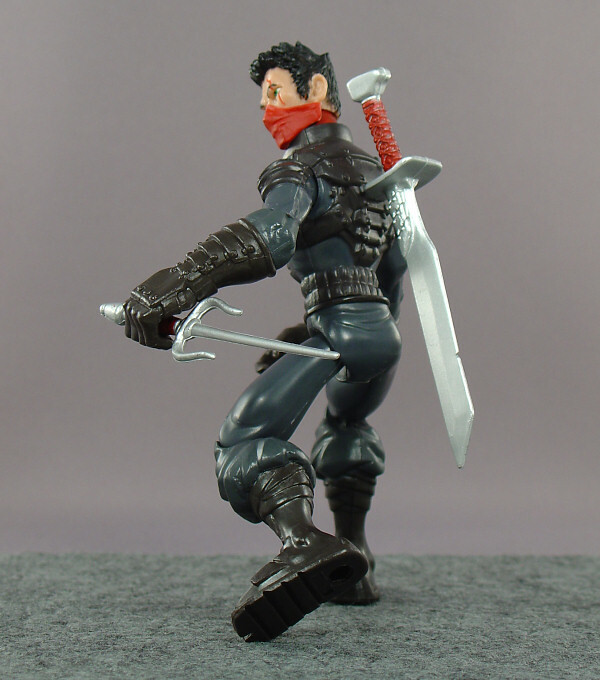 Consider the larger Dragonball Evolution and Prince of Persia figures that came out in the past couple of years: minimal articulation, goofy action features, and price tags in excess of $10. Eclipse, on the other hand, has decent articulation, no silly action features (admittedly this might make him less appealing to some kids), and only costs $2.95. 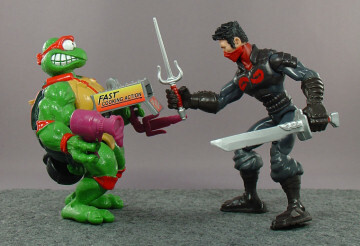 Even the 2007 TMNT movie figures from Playmates -- the most comparable to these in terms of size, appearance, articulation, accessories, and theme -- initially retailed at $7.99 and higher... yet the Dragon-Do warriors are only $2.95. Even Power Rangers figures can't beat that value. 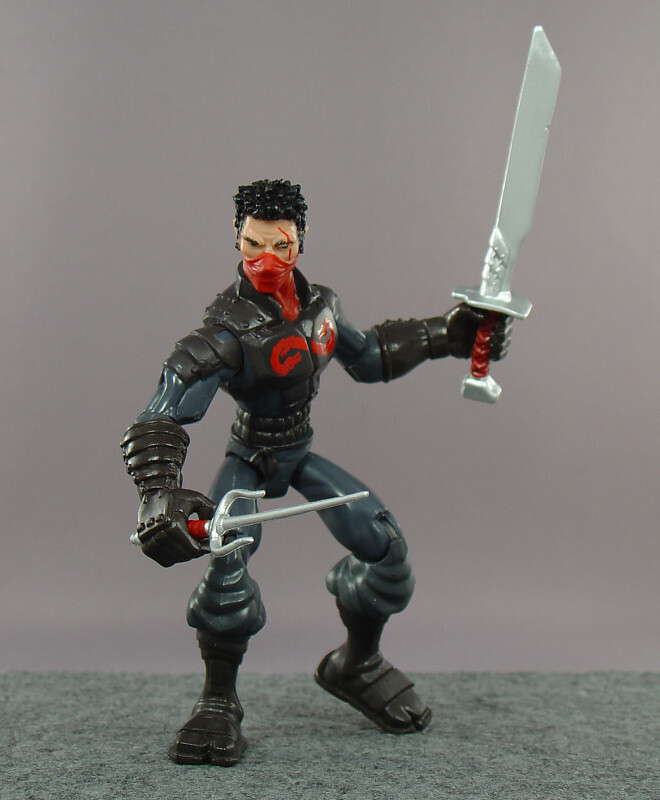 Stylish evil ninja with a wicked scar! While Eclipse isn't a proper collector figure, I have absolutely no problem recommending the toy to collectors. The figure still remains quite poseable, and it's easy to understand and forgive its minimal shortcomings given the impressively low purchase price. If you're buying for kids, however, my recommendation is through the roof: the articulation is just right for youthful play, and the animated style might make the figure even more endearing to a younger audience. In any case, deals on lingering Marvel Legends 2-packs notwithstanding, where else are you going to find a wicked cool 6" ninja for $2.95? That said, so far I've only seen these figures at the Post Exchange on the local military base, so it's possible that these are PX exclusive figures. 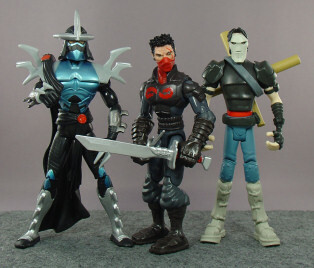 If so, that's a shame -- if Lanard saw fit to bring the Dragon-Do warriors to the shelves of major retailers, these guys could be serious contenders in the action figure arena.